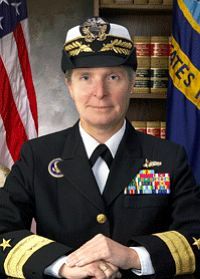 Deborah A. Loewer, Spaatz #285, a U.S. Navy officer presently assigned to the staff of the National Security Council, was nominated for promotion to Rear Admiral (lower half) by President George W. Bush and pending Senate confirmation will become the first Spaatz Award recipient promoted to flag rank in the U.S. Navy. Admiral-select Loewer, a former member of CAP’s Ohio Wing, serves in an extremely visible position as director of the White House Situation Room and also of the NSC’s Systems and Technical Planning Staff. Loewer holds degrees in Theoretical Mathematics and Computer Science from Wright State University in Dayton, Ohio, and a PhD in International Law from the University of Kiel in Kiel, Germany. She received her commission through the Navy’s Officer Candidate School in 1976.